The new revenue recognition standard, ASC 606, represents the most sweeping change to revenue accounting rules in years. 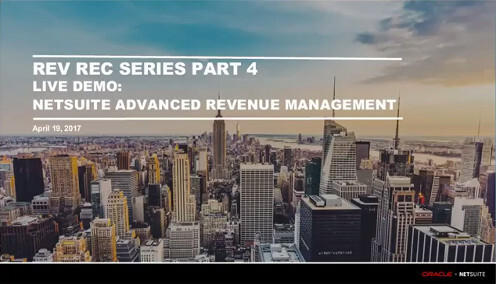 NetSuite's new Advanced Revenue Management solution streamlines the revenue accounting function to ensure compliance with current and future FASB and IFRS guidelines. Watch this demonstration to understand the flexible revenue management engine that supports different delivery models for high tech products and services. Gain insight into granular reporting capabilities to recognize revenue under current GAAP and the new standard. Learn how multi-book accounting capabilities can be leveraged to support the transition period and prepare for the arrival of the new standard and solve the challenge of complying with evolving regulatory standards.